We are proud to offer our locally quarried granites, serpentine, and basalt as well as a full line of granite, marble and other stones from around the world. We handle all phases of fabrication and installation. We welcome all projects including counter tops, interior and exterior projects, hearths, vanity tops, tub surrounds, shower walls, landscape steps, memorials, signs, and custom fabrication. We stand behind our quality craftsmanship and excellent customer service. We welcome you to stop by our showroom in Sagle, Idaho, just three miles south of Sandpoint, and browse through our fine selections of natural stones, quartz material, and unique displays. We welcome the opportunity to visit with you and explain our process. Our qualified staff can help you through the steps of design, cost estimating, material selection, fabrication, and installation. We handle all phases of fabrication and installation. Tours of our fabrication facility in Naples, Idaho are also available upon appointment. 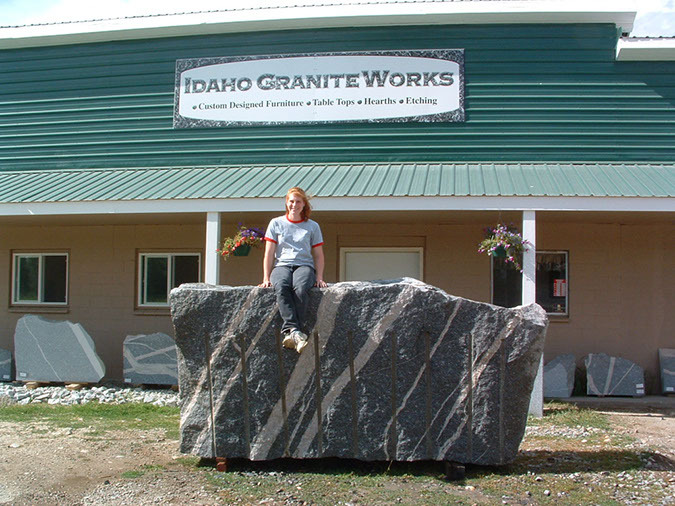 Idaho Granite Works will gladly help design your custom creation.